Over the past few months, it’s been an absolute pleasure to have formed friendships with fellow health food bloggers over Twitter, Instagram or through the fabulous Health Bloggers community. Sharing inspiration, ideas and recipes with those who have the same passions, interest and excitement really gets a buzz going and the juices flowing. 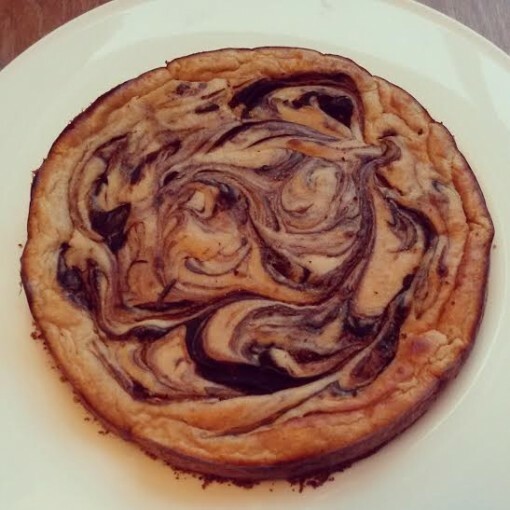 Some of these conversations over social media have turned into collaborative projects and resulted in guest blogs; I’ve had some wonderful recipes including Sam’s Homemade Protein Nutella, Hedi’s no-bake Peanut Butter Cheesecake and Zanna’s Healthy Protein-Packed Chocolate Cupcakes. With more on the way, it’s one of those things that can be constantly innovative, creative and fun when partnering up with others and hosting your ideas on their blog to reach a new wave of followers. I’ve done quite a few guest blog recipes myself, so I thought it’s time to keep them all under one ‘roof’, so to speak, as a reference. 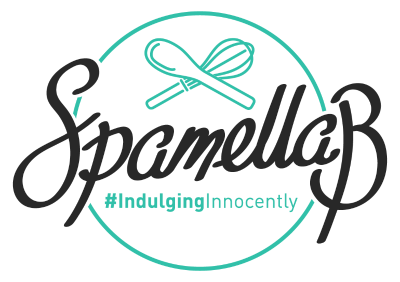 I’d like the thank the lovelies below for inviting me to host my recipe creations on their sites, there really is a lot of talent out there and it’s an honour to have the opportunity to be exposed to a whole host of new readers and fans of health food and clean eating cooking/baking. It was an absolute pleasure to be asked by the gorgeous, talented and inspirational Hebe aka @healthyhappyheebs to create a guest recipe for her wonderful blog, packed full of clean eating but bloody tasty looking protein treats. 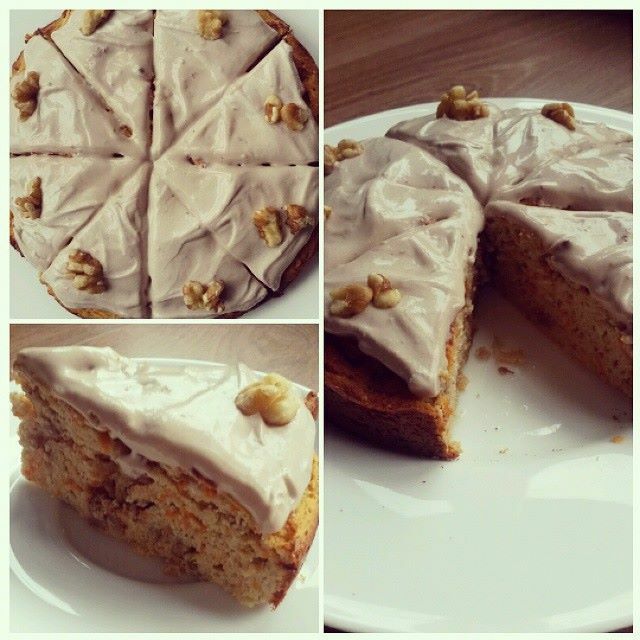 I fancied making a healthy, gluten-free, high protein carrot cake alternative, so this was the perfect excuse to get experimenting in the kitchen! 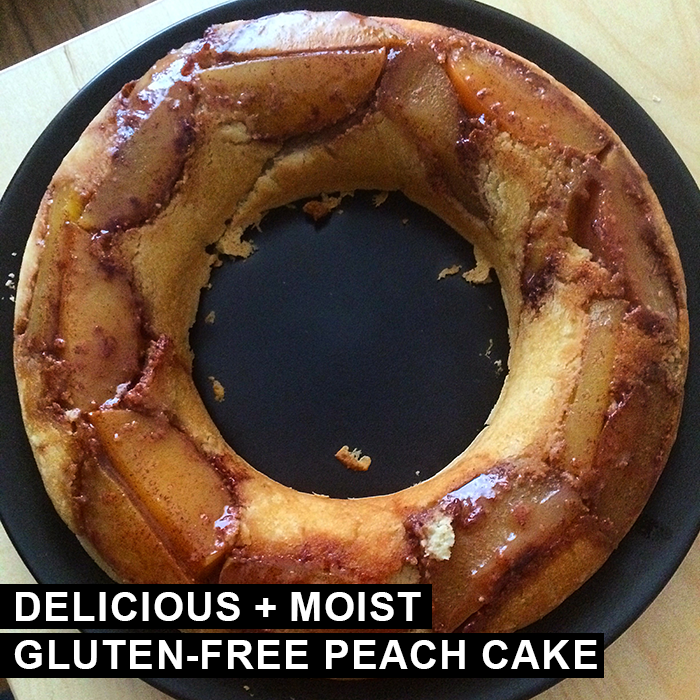 The result was an amazingly moist, spongy cake, thanks to the addition of the magic ingredient – silken tofu. Creamy, high in protein and low in fat, it works together so well with the other textures and flavours. With delicious spices and carrots, plus a topping of Coyo coconut yogurt for extra richness, this is ideal to make for friends, family or if you’re wanting to impress – just try not to eat the whole thing before others get a chance to try it! A few weeks ago she has shared my Raw peanut butter and banana cake on her blog, so I decided to return the favour by sharing her amazing Spiced Pumpkin and dark chocolate chip slices with Acai berry frosting with you today. I recently bought a spring-form tin (I know, the excitement!) so thought I’d give an upside-down cake a go, more so for its pretty finish with a pattern of fruit on top. After debating which combination to go for – Apple & Cinnamon, Pear & Almond, Raspberry & Vanilla – I thought I’d go for peach with almonds and to use a ‘batter’ made mainly from blended chickpeas for the sponge. Honestly, it might sound completely mad but blitzing these pulses up along with other ingredients really does result in a delicious, creamy, soft cake, which with a ‘syrup’ made simply from coconut oil and Sweet Freedom natural fruit syrup (note from the editor: I used runny honey instead of the syrup and it worked a treat! ), this really is a decadent but guilt-free dessert or tea-time treat! Big thanks to Jess for inviting me to create a healthy but tasty recipe for her wonderful blog focused on fitness, health, fashion and adventure. It’s credit to the amazing Health Bloggers UK community that we have crossed paths and formed an online friendship along with the other inspirational members that has spurred this on, so we have Fab to thank for this little collaboration, too! I’ve always loved cheesecake while I was growing up, but when I discovered I was wheat intolerant when I was about 16, I totally cut it out of my diet, particularly since I lead a low-carb/high protein and clean eating focused lifestyle. Recently, as I’ve been pouring through Instagram and seeing stunning, healthy creations by the likes of Samantha Hadadi and Nicky (of course! 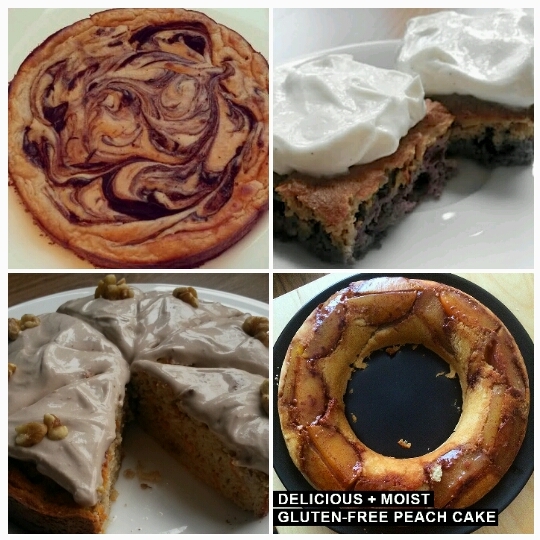 ), it inspired me to get experimenting and whip something tasty up that I could enjoy – totally guilt-free! I absolutely love any sort of nut butter, so of course this recipe had to include it somehow – I used Nuts’n’More’s Chocolate protein peanut butter here. Vanilla is another favourite of mine, so mixing this flavour using extract and Optimum Nutrition lean whey protein powder with a touch of ‘chocolate’ in the form of Walden Farm’s incredible calorie and sugar-free chocolate dip makes for an ideal combination. Using silken tofu instead of cream keeps the fat content low and the protein levels high, plus a cheeky base of ground nuts and coconut oil boosts the healthy fat content, too; all in all, a heavenly treat when you’ve got a craving for something creamy and sweet! 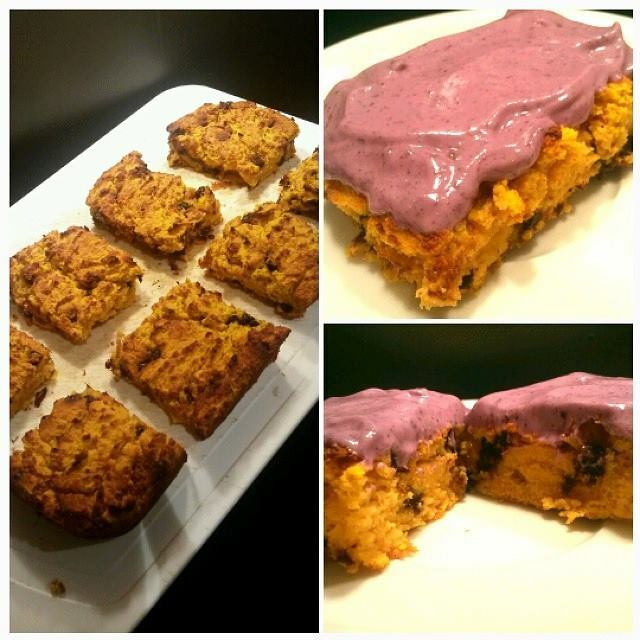 I recently experimented using chickpeas instead of flour when I was doing some protein-focused clean eating baking. I was intrigued to give it a go after seeing a few recipes include them, and must admit, I wasn’t so sure it was going to work well – I expected a dry, crumbly texture rather than a soft and spongey one…how wrong I was! 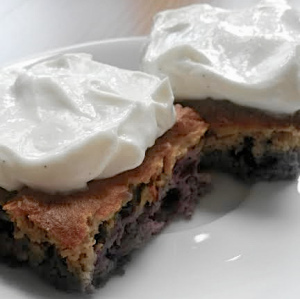 After receiving a lovely message from Louise inviting me to create a healthy guest recipe, I thought I’d create a variation of the recipe, using vanilla and blueberries, rather than a chocolate flavour. The result is a moist, sponge-like consistency bursting with berries and a delicious vanilla flavour, balanced out by a ‘creamy’ topping. Get baking and enjoy!